In this program, you will engage in rich coursework focused on critical perspectives and goals connected to the use of education for the creation of a more equitable society. You’ll have opportunities to collaborate with faculty on current research and gain invaluable experience teaching at the middle and high school levels. The master’s degree in Secondary Education will prepare you to teach in grades 6–12 across all curriculum areas. You will deepen your understanding of subject matter for teaching through this program, focusing on eliciting students’ ideas about subject matter and connecting students’ ideas to that subject matter, all while partnering with schools as a member of a teaching team. Our Secondary Education program attracts students who want to take on the challenges and rewards of teaching diverse, historically marginalized learners, however, you will be prepared to work in any school and with any student population. Specific program opportunities (and funding) may be available depending on your concentration (e.g., Noyce Program for STEM undergraduate majors wanting to pursue an M.Ed., Patterson RAPS internships for English Language Arts specialists). Successful completion of the master’s degree in Secondary Education leads to a recommendation to the state for a teaching license in your selected area of concentration. The Office of Teacher Licensure coordinates teacher licensure policies and procedures for the secondary education program so you’ll be prepared to meet Tennessee and other accreditation standards for teacher licensing. Peabody College graduates who become licensed in Tennessee can also become licensed in other states. However, the completion of licensure requirements for other states may require work beyond the normal degree requirements, especially if your undergraduate program was missing certain liberal education categories or if you did not major in the academic subject area for which you are seeking licensure. Program Director: Andrew Hostetler, Ph.D. Secondary Education graduates hold teaching positions in the United States and around the world. They find teaching jobs in public, private, and charter schools—typically the jobs they want, in the places they prefer. Most Secondary Education graduates eventually move into positions as teacher-leaders, enabling them to mentor others and advocate for students and the profession. Some graduates are affiliated with nonprofit institutes. 98% of Secondary Education graduates were employed or attending graduate school within four months of graduation. Learning to teach occurs through practice. Lessons are learned in interactions over time, requiring both the opportunity to act and space to reflect. One aspect that makes our Secondary Education program stand out is our teacher candidates’ constant engagement in fieldwork and residencies with local schools, where you will observe, participate, and teach. These practicums are under constant revision, designed to provide you with the optimal mix of theory and practice and to ensure you are always safe to practice and ready to learn. 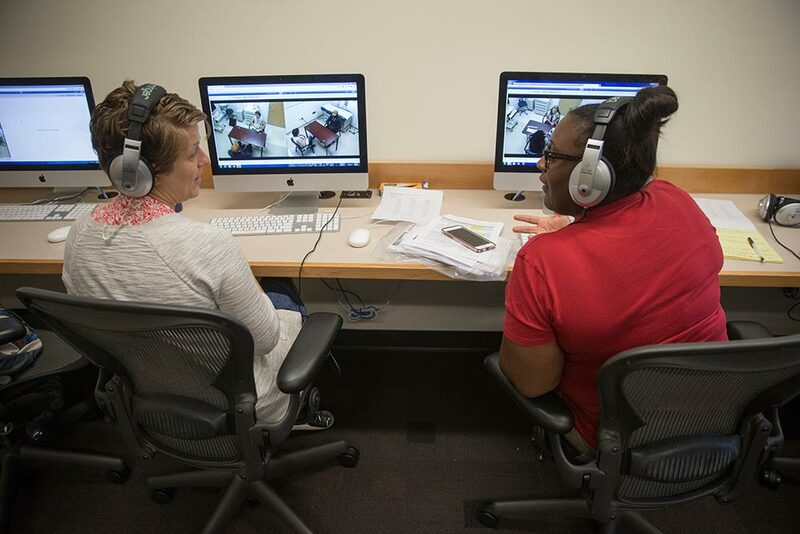 There are two coursework tracks to the Secondary Education degree, allowing you to complete the master’s degree in one year (June through May) or over four semesters in two years. Making your choice for the 1-year or 2-year program depends upon your point of entry into the program, how many courses you want to take each semester, and whether you want to pursue opportunities that involve being in schools full time during your second year of the two-year program. All students also complete eight hours of field-based work. All students are required to complete four to six hours of coursework to meet the requirements for teacher licensure. All students seeking licensure additionally will need first aid and CPR training within two years before licensure recommendation. Students seeking licensure in English will need to complete two semesters (or the equivalent) of college-level coursework in a foreign language. Depending on your specific licensure, you may need to complete up to five additional credit hours of coursework to complete your degree. Elective courses may be taken across Peabody College, as well as in other disciplines offered across Vanderbilt University upon consultation with your faculty advisor. Department faculty work in research and teaching collaboratives that include both theory and practice-oriented scholars. They share an interest in the relationships between student learning and where the learning takes place, in addition to a commitment to mentoring your success.